It’s hard to believe that plus-size retailer Ashley Stewart has been around for 20 years, but it’s true. I personally became a fan many years ago when I noticed the diverse stylish clothing choices and items that were made to “flatter” curvy bodies and not make us look “frumpy”. I know I talk about this company daily but that’s how much I “really” like the clothing. No denying that at all. 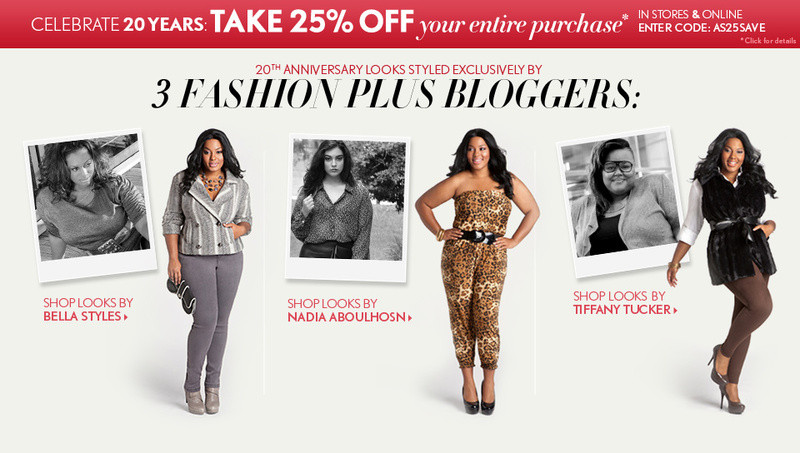 As I mentioned a few weeks ago, myself and two other plus-size bloggers, got the chance to style 3 looks for “Ashley Stewart’s 20th Anniversary Lookbook”. Well the images were released today and I couldn’t be more ecstatic. My first look is for the jet-setter who wants to be comfortable as well as stylish while traveling. It is the grey sateen jegging ($34.50) and striped wool coat ($69.50). I paired the look with the faux fur bootie ($59.50) in off-white and a clutch bag. For my second look I wanted to pull together an ensemble for girls night out or as Beyonce would say, “a freakum girl” look. I put together the brown strapless jumpsuit ($39.50) along with the belted faux leather vest ($49.50). (I swapped out the original belt that comes with the vest for one with more “bling” to it. I also added a pair of leopard pumps ($36.50) from the new Ashley Stewart shoe line. Lastly, I wanted to style the career woman who could take her outfit straight from the boardroom or to church on Sunday morning. It is the ever so glamorous faux fur collar cardigan ($89.50). I paired the cardigan up with the high-waisted plaid trousers ($36.50) and the aqua ribbed turtleneck sweater ($24.50). I have to say that the third look was my favorite to style. I actually am having Ashley Stewart to send me this outfit to blog on at a later date. I tried it on while styling it and the trousers fit me perfectly. I normally tend to shy away from high-waisted pants for myself but with the cardigan being long-length, I was very comfortable with the finished look. This was a wonderful opportunity for me to be apart of and I hope you like the looks that I styled as much as I do and fill your fall wardrobe with a few pieces that I chose!